The Necker Surf Goggles were designed to offer protection from the elements and the best visibility in a variety of surfing conditions. From Flat light fog to scorching tropical glare this is the lens for you. Proven for surfing, kiteboarding, PWC and handcrafted in Morro Bay, California, USA. Amber Polarized Mutating Lens that changes to Dark Gray Lens based on high or low UV intensity. One lens for all your needs! This is our Newest Design and like all Kurtis Surf Goggles was developed after I underwent my own pterygium surgery at 23 yrs. old. I knew that they had to be safe, functional, flexible on impact and float. I also knew they had to look stylish and be made of the finest materials to hold up in intense conditions. Most importantly I wanted to Save Surfers Eyes. The release of the Necker was thouroughly tested and took over 3 years in the making, but finally this version matched my dream and tested well with surfing and kiteboarding world champions, Kurtis Team Riders, doctors and while on Necker Island even Richard himself. "I want our customers to avoid the glare and to be stoked on the Kurtis Brand. It is my goal to protect eyes and enhance vision in all surfing conditions. " Do you want to surf in comfort or fry your eyes? 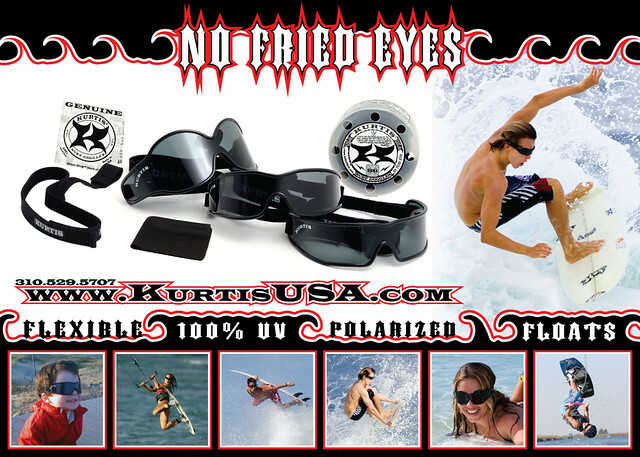 Come shout "No Fried Eyes" with the Necker Surf Goggles by Kurtis.